After a 4 years hiatus, Marine Cove opens its doors to public once again. If you had been to the old Marine Cove, you probably remember Mcdonald's, a bowling alley, a mini amusement park with claw machines (where I learn my trade) and a wide array of restaurants. This was the most happening spot in East Coast Park during its heydays. Thus when the time came for it to be demolished, there were heartaches all around Singapore. 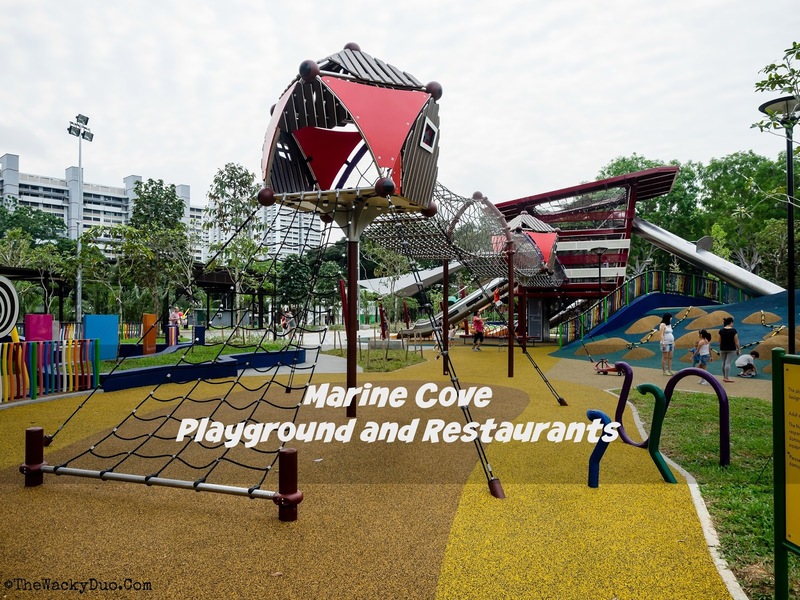 When news flows that Marine Cove is reopening this weekend, there were many oohhs and ahhs when a mega FREE outdoor playground is unveiled within its 21,500 sqm vicinity. Does it live up to it's hype? In the past, Marine Cove eccentric mix of tenants means limited running space for kids . Sure there is a playground at the old Mcdonalds, but it probably can only fit 10 kids at the same time. With the new 3500 sq meters playground , it will still feel spacious with 200 kids at the same time. The star of the playground would be the 3 storey play tower at the center of the playground. The tower is connected to a rope bridge and 3 slides of different level. Access to the top can also be made through a funnel net in the middle. The playground is purposely build for kids of varying ages up to 12. For younger kids, easier climbing structures are available. The different structures provide a variety of experience for the children. Not only does it caters to different age groups , the playground also caters to children of different abilities to play together. Inclusive play equipment such as swings with safety harness provides security. Other special needs friendly equipment include sensory play panels that creates a sense of discovery, motor skills, hand-eye coordination , rhythm and movement. With acres of space and orientation towards the open sea, this playground provides a breezy option for families with young kids. Due to the open nature of the playground. It may be best to bring the kids in early in the morning or late in the evening to avoid the afternoon sun. There is also a standalone toilet facilities with cubicles build for the kids in mind. Toilets and showering facilities are available. As per the public toilets found in other parts of East Coast, toilet paper are NOT available in the individual stalls but near the entrance. More often than not, it would be empty, so do carry your own tissues for emergency. If you spot these round rings around the park, do note that they are meant for bicycles. Overall, this playground reminds me of the playgrounds we found in Australia. It has acres of space for kids to move and has enough stations to challenge their mobility. The only thing missing is water play and that is a curious omission given that it has a beachfront location. The play structures are relatively familiar. In terms of design, it is quite generic and does not look out of place compared to the smaller playgrounds around Singapore. A pity considering its potential. A more adventurous theme such as a seaside or a nautical theme would have been great for this space. It is not the only MEGA outdoor playground in town. Other mega playground such as Pasir Ris park, West Coast park and the children's playground at Gardens by the Bay comes into mind. Given it's location and the range of restaurants near its vicinity, it will no doubt be one of the more popular ones in town. Like the old Marine Cove, there are a host of family-friendly F&B establishments with dining concepts ranging from local favourites to Western café food. The five dining outlets, which will open progressively from 28 June onwards, include Babalicious, Hill Street Coffee Shop, McDonald’s, My Briyani House and The Coffee Bean & Tea Leaf. They are all housed in the elongated building where the old bowling alley once stood. Fall in love with Mcdonald's all over again at Marine Cove.This Mcdonald's is unique in Singapore offering more than just a happy meal. Salad bars and unique sandwiches and cakes makes this a must visit place for Mcdonald's fans. This upscale Macdonald's is one of it's kind in Singapore! With over 200 seats comprising of indoor and outdoor seating, you can chill all day with your favourite beverage here. For a more localised version of Kopi, Hill Street Coffee shop will be your best bet. Enjoy signature local delights such as Steamed Kaya Butter Bread Set, Kampong Rendang Chicken Nasi Lemak and Laksa here. Whipping up authentic Peranakan Cuisine with Hainanese Chicken Rice, this restaurant includes a play area for kids to compliment the bigger playground at its doorsteps. My Briyani house is a HALAL certified restaurant specialising in Indian - Muslim food such as prata, goreng, nasi briyani and signature curry fish head. There may be lesser F & B Outlets than compared to the past, but it covers all the essential food for most. The only way to Marine Cove is via ECP Service Road. There are a two carparks of either side Carpark C2 and Carpark C3 . Alternatively you can park at Marine Parade estate and take the underpass to the location. There might be more parking but with only one road, do anticipate traffic delays on the way to Marine Cove especially the next few weekends. Given it's newness it would probably be a chaotic mess with eager Singaporeans checking the location out. Once the hype is over, this will be a great place to bring kids to whenever you need to relax. Chill and Marine Cove anyone? Park at the marine parade estate? Hello... not helping at all.. do u know how big is marine parade??? Nice recreation for growing children. But try not to go on sunny weather for long duration play. It's very hot! And lastly,there's no ATM machines available. So upset. How can we get to the East Coast Lagoon Village from here? Also, which area is the Lagoon Village in? Is the bus 401 bus stop near the marine cove? Bus 401 runs only on Saturday (I think from 12 noon till 10 pm) and Sunday (I think from 2 pm till 8 pm). Not sure if it runs on the public holiday.